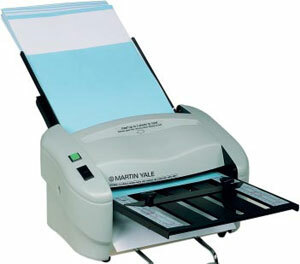 The Martin Yale 7400 Paper folding Machine is small and easy to store. This machine does most common fNEWs and a continuous feed of up to 50 sheets of 75gsm. Able to accommodate most copy papers and letterheads. This unit is sure to be a success in any small office or moderate mailing environment.